U.S. watch sales fell the most in seven years in June, one of the first signs Apple Inc.’s watch is eroding demand for traditional timepieces. Retailers sold $375 million of watches during the month, 11 percent less than in June 2014, according to data from NPD Group. The 14 percent decline in unit sales was the largest since 2008, according to Fred Levin, head of the market researcher’s luxury division. I'm not really sure why it took me so long to post this, but I gave this speech at my high school graduation this past June, and I thought it was worth sharing. Other than some minor changes for publication, this is the speech as delivered. Well, we made it. We’ve been through a lot in our four years here in high school. We’ve had a lot of fun, a lot of accomplishments, and a lot of memories. And while it might seem like a great time to take a breath of relief and relax for a while, we’re not done yet. In fact, we’re not even remotely close to being done. 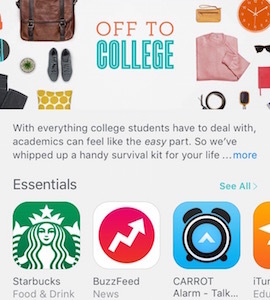 A few days ago, Apple posted a list on the App Store with their recommendations for apps for "Off to College." Unfortunately, I found this list a bit lacking, especially considering that the top picks were Starbucks and BuzzFeed.